That Memory Foam Smell - Is Memory Foam Toxic? Some of the chemicals used in memory foam aren’t entirely benign. Does Your Memory Foam Pillow or Mattress Have an Unpleasant Chemical Smell? One of the biggest complaints by owners of memory foam pillows and mattresses is the unpleasant, and potentially unhealthy chemical smell. Memory foam is manufactured using polyurethane and several other chemicals, so it isn’t surprising that it emits a chemical odor. This “off gassing” of volatile organic compounds is a common and well-documented property of memory foam pillows and mattresses. The fumes are often compared to those experienced in a freshly painted room. If you are experiencing this odor, the good news is you may not have to endure the smell for long. The bad news is that some of the chemicals used in memory foam aren’t entirely benign. Will the Odor Go Away? Many memory foam mattress owners report that the off gassing period ends after a number of days. Of course there are many factors which influence this including the product, the type of foam, the sensitivity of the person, the room ventilation and more. 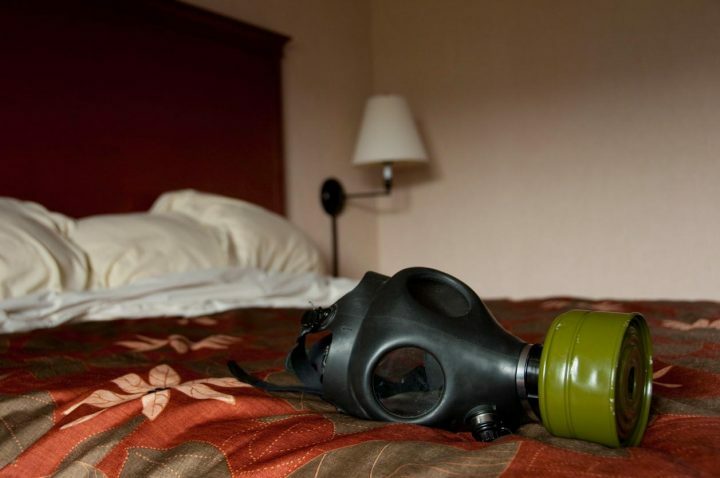 Even if the initial odor goes away, it is natural to wonder if there are health issues related to off gassing. Most people do not report any health issues resulting from their memory foam pillow or mattress. However, there are various reports of headaches, nausea, and allergic reactions resulting from the odor produced by memory foam. If you are experiencing any of these symptoms, you’ll want to avoid sleeping on the foam during the initial off gassing period. You can leave the pillow or mattress in a well-ventilated area for a week or two and see if that helps eliminate or reduce the odor and symptoms. If after several weeks, the issue persists, it is probably time to consider an alternative to memory foam. Is Long-term Use of Memory Foam Healthy? The long-term effects of memory foam and its toxicity are not fully understood, but there clearly is some reason for concern. Aproximately one-third of your life is spent in close contact to your sleeping surface, so it is important to consider you and your family’s health when selecting a pillow or mattress. Are you interested in the support and comfort provided by memory foam, but want to avoid that chemical smell? There are several natural pillow options for those looking for a new pillow. Of course, our favorite is our buckwheat hull pillow. Besides being natural and chemical-free, buckwheat pillows are a great alternative to memory foam for a couple of other reasons. Memory foam is not breathable and this can result in a hot and sweaty pillow. The shape and particulate nature of buckwhat hulls leaves a lot of air space in your pillow between all of the hulls. This airspace allows warm moist air to escape, leaving your pillow cool and dry. While a memory foam pillow conforms to the shape of your head, the overall shape and thickness of the pillow is fixed, making the pillow less adaptable to your sleeping position. The fill in a stuffed pillow can be shifted and adjusted for a wider variety of shapes and sizes. 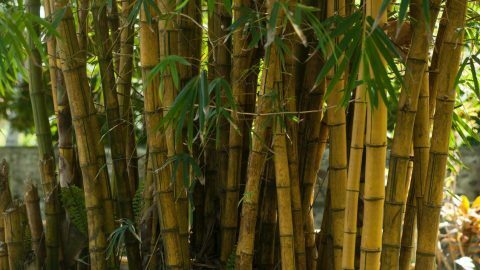 If you’ve decided against a memory foam pillow and a buckwheat pillow isn’t right for you, other natural alternatives to memory foam include pillows filled with down, cotton, wool, latex, kapok or millet hulls. Have you tried a buckwheat pillow? Give Hullo a try for 60 nights. If you're not sleeping better, send it back to us for a refund. Yes indeed there is something to allergic reaction to foam.. My mastiff has a leg problem and a friend gave me a single memory foam piece, plus a other type of foam for my dog to lie on. That when it started, my sinus headaches, lethargic feeling. I have never had headaches in my life. I had to use nose spray every day and take strong pain relievers. I tried to think what was in the air, what was different and I could not think of anything. So I suffered. Got ringing in my ears that came along with it. I had my ears cleaned by the doctor and the ringing went away but only the ringing the sinus headache persisted. My mastiff sheds and I threw away his bedding because of so much hair trying to clean the air out of my home. That was 3 days ago. Guess what no more sinus headaches and now I have major energy. It went away immediately. Oh I am soo happy about this I suffered from this for 3 whole months every day from the time I got up until I went to bed. Now I am free. I have had a memory foam mattress for nearly 3 years, as time has gone on I am very lethargic, almost feeling as if I’m drugged up, headaches and ringing in my ears also, I thought that I was going crazy and becoming lazy as I have no energy but thanks to your post , there is light at the end of this very weary tunnel. and I’ve been sleeping on it for 2 months. I suspected that it might be the pillow so I looked it up on the internet and found this site. Jayne, you explained exactly what I’ve been experiencing. I also thought I was going crazy, now I know. Getting rid of my pillow today!!! I am 3 months pregnant and we bought 2 new memory foam pillows a few months ago. My hubby and I have slept awful and have sinus issues every day. The pillows do have a funny smell but I figured it would go away after a few days but it didn’t. I’m throwing them away today and I will get back to you on our health report. Sweet dreams! As I read everything about the gas-off, I finally understand part of my problem. I knew that my MCS made it possible for me to be allergic to my mattress, but, truthfully, I hadn’t done research on the cause, yet. I’ve had my mattress for 5 years, but the smell has never gone completely away. As a matter of a fact, it’s actually gotten worse. And I can tell that inhaling the smell is damaging to my breathing. So, I now am looking for a mattress with absolutely not a bit of foam in it. What upsets me most, after the health effects, is the fact that no one in the furniture stores selling these mattresses won’t even talk with you about it. They don’t know about it, haven’t heard about it, or just plain don’t want to admit it, or are too busy or lazy to do some research on the subject. Think about this, all of our couches, recliners, comfortable chairs are made with this foam! No wonder we have more and more people with all the problems that can come from breathing the gas, and I believe, even sleeping on, sitting in the chairs! Too many chemicals! Why are we doing this to ourselves? Maybe we all need to start speaking loudly, protesting with our wallets. That might affect the market and “maybe” there will be some changes made!! A person can only help. Off to continue the search for a mattress with no foam! Have had (tempurpedic) pillow over a week. Smell not reduced and gets on clothing. I have developed sinus headaches as well. Completely irresponsible of the manufacturer not to warn the consumer. State the chems inside. Complete waste of nearly 100 dollars. Last tempurpedic product I will buy. Thanks I really liked what you presented here. I had the toughest time selecting a decent mattress for my dad last year. His leg suffered some damage when he was in the army, and the stress from walking with a limp is really bad for his back. I wish I had found your post sooner, because this seems to be the perfect fit for his need. He’s doing well with his Latex mattress too though. We just have to take care of the pillow he uses, because he loves the big fluffy ones but they raise his neck too much. Plus, I didn’t know Latex mattresses collapse in the middle with time. I just purchased two memory foam pillows and they sit on the top of my closet the smell gave us a bad allergic reaction, scratchy throat and sinus problems. Very disappointed in this product the price was outrageous and no warning. I like the honesty and oddball details in your review, haha. I’m kinda strange with my pillows – I’ve had my current one about 4 years now because I’ve never found another that matches it’s particular feel. So, that being said, how would you describe the lumps? Can’t say I’ve ever felt lumpy flour… but I’d assume it’s softer than the traditional cheap and crappy lumpy pillow, right? And does it seem to smooth out at all with the weight of your head or does it remain lumpy? 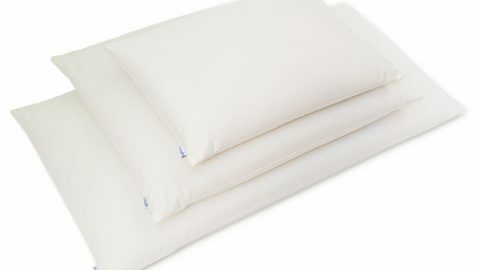 Do you think after using it for a while it might be good for someone who likes forming their pillow a little differently every night? Have been suffering with sinus and a very bad ringing in my ears the past year odd,doctor prescribed me sprays etc,I would wake up every morning with painful neck and popping ears,threw out my memory foam pillows last week and all of a sudden no problems anymore! !its crazy to think that a pillow did this,very careless of manufacturers not to mention potential side effects of memory foam products! I have just purchased a memory foam mattress .I dont like it .It really has an offensive smell. It was cold last night but I still had to sleep with the window open but the smell is still there in the bedroom today despite having left the window open continually. Im very disappointed and wished I had known it would have a smell before I had bought it. feel like I will have to pursue with it now though as I have spent all that money..but I will never buy another one! I will never, ever, purchase a memory foam mattress again, I recently bought one and the toxic odour is unbearable. I could not sleep on it, and left the window open all day and night. There ought to be a warning with it, in case anyone suffering from asthma can have a bad attack. These type of mattresses should be banned! I am getting rid of the rubbish and replacing it with a natural filled mattress. Not foam or memory foam insufferable, toxic garbage. I would no recommend them for a dog. I have had my memory foam mattress for almost four months and it still smells up the whole bedroom with a strong chemical smell. Love the mattress hate the smell; will the smell ever go away? Many report that the off gassing period ends after a number of days, but of course there are many factors which influence this including the product, the type of foam, the sensitivity of the person, the room ventilation and more. I just bought a mattress and was never told about the off gassing I went to bed on it the first night it felt very comfortable then I woke up middle of the night with a panic attack it has not stopped since. I am considering buying a no chem wrap to put over my bed and it is suppose to stop the off gassing from going up into my skin and air I breathe as I sleep. The manufactures should have a major warning label I think it’s horrible because I am feeling terrible from the mattress and people think I’m nuts when I tell them about it. This is horrible, wish you all the best honestly! 2 to 3 months ago we bought a new mattress with memory foam and I was hoping the horrible smell would wear off and it hasn’t . It was an expensive buy for us so can not see us being able to buy another one. I agree it is a toxic smell and I hate it. I would never buy a memory item ever again. It makes me feel ill.
I’ve had a memory foam mattress I bought off amazon four years ago. The smell went away after a week, and I haven’t experienced any issues. It really is the most comfortable mattress I’ve ever slept on. Fast forward to four days ago, my partner and I bought a smaller one for the guest room. That thing wreaks so bad that I had migraines and nausea just from being in the room for twenty minutes. I’m prepared to wait another week, but it seems to me that like any purchase made nowadays in this company owned world, that it’s hit or miss. Some of this crap is good, some bad. You can’t trust reviews, so what the heck can you do? dont buy cheap knock offs like around 300-600 usd. get things around 2k，good ones do not smell at all. Don’t believe it! While cost may have something to do with it sometimes, we paid $2600 for a Tempurpedic mattress and the smell has not gone away after 25 days! We dropped good money on a Serta and it reeks horribly 10 days in. It’s going back. Paid $1600 for a Serta. After 2 months, I demanded a store credit towards a different mattress. The smell was so horrible it spread through my entire 1400 sq ft home. I live in FL, it was the middle of summer, it got into the ac ducts as well. Took months to dissipate even after the darn thing was gone. I purchased what I thought was a fantastic deal; two pillows with polyurethane gel beads described as memory foam pillows. The outside packaging said if there was a chemical smell remove the outer cover for 24 hours to let the fumes dissipate. I set the pillows out on my open air back porch for 5 days and they still emit a terrible chemical order. I initially chalked it up to cheap materials because of the bargain price but decided to do some investigation on line to see if the fumes were toxic. I’m going to toss them today. I’m glad I came to this site because my game plan was to buy a memory foam mattress if the pillows worked for me. Not now. I’m going to stick to a natural alternative with my next purchase. I recently was visiting a friend out of town and slept in her guest room 3 nights in a row. I had not slept so good in such a long time. No back pain or stiffness. I came home from out of town and first night home next morning woke up with stiffness and pain. I called my friend and asked her where she got her memory foam mattress topper at and ordered one. It arrived and I let it sit out for more than 8 hours before actually putting a mattress cover over it before sleeping on it. Smell was strong I asked my friend if it smelled bad when she got hers. She said the smell went away. But, I’ve had it for 3 weeks now the smell is so strong it stays on my pillow and my clothes and I have been sick since I’ve been sleeping on it. Symptoms include sore throat, pain around my ears and neck that is very painful. Allergies and sinus infection. 2 sets of antibiotics I start to feel better. Then, I sleep and start wheezing so now coughing. Having to do breathing treatments. My back loved the mattress topper. But, my respiratory system doesn’t. I have to return it. Now to find something comprable fo the feel of memory foam. Any suggestions? So, disappointed! Please warn your family and friends about the potential health hazards of using memory foam. Especially our elders and our children. You wrote this a year ago so likely your issue is resolved one way or the other. My husband and I had our hearts set on an Essentia mattress after going to their showroom last week. They are made of latex which is natural…no smell, and SO comfortable. They conform to the shape of one’s body. We decided to visit a store that sells Tempurpedic just to compare. We tried out many beds but the soft Tempurpedic was the only one that was very comfortable; about 80% as comfortable as the Essentia mattress. The price was right and my husband insisted on buying it when the saleslady said that we could return it after 30 days if we didn’t like it. It was delivered and OMG…the smell was overwhelmingly chemical. We could smell it from a distance. Imagine sleeping on it?… We decided after 2 days of airing and polluting the living room (we didn’t sleep on it.) that it was unreasonable to expect us to store it and endure the smell for a month…or more…or forever… before being able to sleep on it. My sinuses were burning and my nose running just being in the same house with it. The company is coming to pick it up tomorrow. i want it OUT! My issue is that was told that I can now only have an exchange. That word changed from ‘return’ at the store to ‘exchange’ once I wanted to return it 2 days after delivery…so I will likely buy a small mattress for a guest bed. I was told that the difference will be returned to me. Let’s see if they keep their word. I purchased a memory foam pillow and immediateIy started waking up every morning with a headache. I would feel very tired and foggy headed. Unfortunately I never thought about it being the pillow that could have caused it so I continued to use it. I now have ringing in my ears and sinus problems. I’ve been to the doctor and have had thousands of dollars worth of tests run to try to figure it all out. I just found this site and a few others that have me convinced to throw away my pillow. Thank you to those of you who have shared your experience. I hope your all feeling much better. I’m looking forward to enjoying my life again. About 6 months ago I bought a 3-inch memory foam pad to give my mattress a softer feel. When it came, the odor was very strong. Since it was winter I couldn’t air it out properly. The instructions said ” air it out for 4 or 5 days”, but instead, I put it in a spare bedroom propped up on its side. After 4 WEEKS, the smell was greatly diminished, so I enclosed the mattress with the foam on top in a vinyl, zippered water-proof mattress cover. Then I covered that arrangement with a regular quilted fabric mattress cover, then with a fitted sheet. I didn’t notice any smell after that. Several months later when I decided to wash the quilted mattress cover, what a shock! The vinyl cover was in shreds. Apparently the fumes of the memory foam are powerful enough to obliterate it. I haven’t experienced any of the symptoms that the other writers listed, but it does concern me. I have severe scoliosis with a very asymmetrical spine and feel exceptionally comfy lying on this foam pad. I purchased a replacement vinyl mattress cover but when I opened the package, was almost knocked over by the odor. So now I’m just using the memory foam pad with the quilted cover on top and with two fitted sheets, hoping for the best. I really can’t smell anything but hope that the toxicity is gone. I bought a memory foam pillow at Woolworths (supermarket in Australia) a few days ago. I could smell it immediately. Let it breathe for a day then put 3 pillowcases on it and tried to sleep on it.. It was certainly very comfortable, but after 2 hours in bed I got up and changed pillows and took it out of my room! The shocking smell had come through the 3 pillow cases. It’s unusable! I’ve kept the receipt and will take it back in a week if further airing doesn’t solve the problem. I’m not hopeful! I recently purchased two different polyurethane foam mattresses from Sleepy’s Retail Store. I returned one mattress after 3 days and have not slept on the other mattress for 102 days, which is when I purchased the last mattress back in February of 2016. One mattress was made in China and the other mattress was made in the USA. Both mattresses gave off a nasty chemical odor as soon as they arrived in my bedroom and were removed from their clear plastic bag coverings. No bedding product should be delivered to anybody’s bedroom with a chemical odor that you are supposed to put your head on. This is extremely dangerous to your health and totally uncalled for. Yesterday on June 3, 2016, I filed a complaint over the phone with The Federal Trade Commission which is an agency set up to protect American Consumers like us. Their website is http://www.ftc.gov . You can file a complaint over the telephone by calling their Consumer Response Center at 877-382-4357. If the FTC or federal trade commission gets enough complaints about toxic odors coming off of mattresses and pillows, they will have their attorneys or lawyers look in to this horrible dangerous problem. If you guys are unhappy with the odors and these chemical odors are making you sick, I urge you to call in to the CRC center and file a complaint like I did. I think we should get a group of us together and file a class action lawsuit against these mattress manufacturing companies. It does not matter how comfortable the polyurethane foam feels if this foam is emitting chemical odors that can get you sick, give you cancer, and kill you over a period of time. We had our memory foam(Serta) mattress delivered about a week ago and were kept awake by the strong smell of the mattress which has not decreased even with open windows and a fan going 24 hours a day. We were told we could exchange the mattress within 120 days but must keep it for 30 days to make sure we were sure we were sure of the decision. I am wondering what we can replace it with. It seemed like just about all the mattresses in that store had some memory foam in them. We will soon be going baack to the store to see what else they have that won’t make our noses burn, give us headaches, make our necks stiff and our skin tingle and feel hot like the memory foam one we bought Thank goodness we kept our old matress and put it in the gurst room where we presently sleep. Guess that old matress wasn’t so bad after all! Any mattress suggestions? I’ve slept with a memory foam pillow for the last 7 years.. I’ve had low energy for a majority of that time, sinus problems, stiff neck and feeling lethargic.. It wasn’t till last November my girlfriend bought me a bamboo pillow and things became much worse. I felt wheezy, swollen glands extremely tired and very bad neck and upper back pains. I even had pressure in my chest and throat, like a throbbing indigestion feeling.. I thought it was something I was eating, until I went online and saw so many other stories of the same symptoms!! I had about 5 different memory foam pillows in my apartment, I grabbed them all last night and locked them in a storage unit. This morning i woke up and had little ringing in my ears, glands are not swollen, hardly any neck pain and the pressure in my throat and chest was completely gone. I have been feeling like this for years, and it’s been terrible. I now can look forward to so much more energy and being happy with no pain. I purchased a Relyon-New-Zoom Memory 9000 A Range Padded Top Ottoman Set. It was delivered on the 24th Aug. 2016. The base was faulted and is being replaced but I was informed by the guy who inspected the bed that the awful smell from the mattress was normal and would fade in time, every day the bedding is taken off and the mattress is left by the open window to air, now six weeks later the mattress is still giving off the unbearable smell, this is causing sleepless nights because every movement causes the smell to rise therefore I am breathing in what seems like toxic fumes. I have not had a good nights sleep from the delivery date and my health is deterioating. After complaining again to the well known shop it was purchased from they are sending some one out once more to examine the said item. I do not recommend the mattres at all. Oh my goodness! I wish that I would have found this site first, but I’m glad I looked now. I was looking because my brand new $130 pillow smells like mildew! Now though, I understand from where my other problems are coming! I got my pillow on Sat, it’s now Wed, and I’ve been miserable! Scratchy throat, gland issues, headaches, ears ringing! I’m not a headache person, nor a “bandwagon” type person, but this is for real! Save your money – and your health! Don’t get the memory foam! I purchased a memory foam pillow for almost 3 year now and that has been a 3yrs of hell with headaches. I have been through many doctors, did scans and couple of MRI, still the doctors couldn’t find anything wrong with me, they put me on lost of medications including injections of steroids to my head. But I still kept having the migraines. Until a frind advice me to check the website. I changed my pillows ASAP and that was my solution. I just bought a $110 memory foam Arctic pillow. It smells SO strong, even stronger than the Tempurpedic mattress that is going back to the store tomorrow after several days pollution my house. But I was told that the pillow cannot be returned. I feel cheated.I have contacted the Canadian government to ask them to seriously consider testing these products that have to contain dangerous and toxic levels of polyurethane and other known carcinogens. Bought two bamboo memory foam pillows a week ago. I’ve been suffering from major headaches during sleep,stiff neck, and husband has been having ringing ears, nausea and headaches. Save yourselves people don’t waste you money. Stick to old faithful pillows. I have had a memory foam mattress for at least 2 years. My daughter gave me her old one which I used under mine to make it higher. I didn’t really like the heat they generated but I thought I could stand it due to the fact it improved my Sciatica when I laid on my left side. I started to feel heat in my right leg the other week for no apparent reason during work. The following day I I found getting out of bed my other leg was loosing feeling. I’ve been in hospital for the last 2 weeks having tests and taking steroids for an auto immune disease. I can’t imagine how I suddenly started to develop nerve problems through an inflammaton of the spinal cord when I hadn’t had any fall or virus just heat at night on this mattress. Anyone had any similar symptoms and also has a memory foam mattress? IMO it is most unlikely that it would be emitting a level of (toxic or allergenic ) chemicals for a conclusion that your recent symptoms are related to the mattress. That is NOT to say that IF the chemicals were still present, that they could not be responsible for the symptoms you described. If I believed that I would be researching the memory-foam chemicals in relation auto-immune disease in general and then looking for any known links to your specific diagnosis. But speak with your practitioner about any link between the older “Sciatica” and the sudden onset of “nerve problems through an inflammaton of the spinal cord” and the auto-immune disease. It seems to me that the medical diagnosis of auto-immune disease should be the direction of your research – it is commonly associated with all body systems and more than frequently with the nervous system. Replacing your mattress may give you peace of mind, but a warning: i had to air my new one ( without memory foam and “allergy friendly”) outside for many weeks over summer and then after I brought it inside to its room, I had to have the window open, the door closed and blocked underneath for many more months. Although I bought it for my use, I decided to keep it for my family guest room and they have all been fine with it. ive got both bad back and asthma – wanted to buy a memory foam mattress but found this site ! Is there any alternative to memory foam? Sid + George many people like me with MCS also experience health problems with VOC odour from rubber products incl. 100% natural latex. The odours are powerful and long lasting before gassing out gasses out over time. it is up to an individual tolerance and how large / new / unexposed the item is. At a rough guess if one can tolerate the smell of the bed shop without ANY adverse effects during OR after trying mattresses, then maybe it won’t be a problem. Sid look for an Asthma friendly one which may be more suitable for you. Thank you my memory foam pillow and my daughters are being thrown out tommorrow when I go and purchase real pillows. I always found the pillow to be comfortable and have slept on it for around a year. However for that year I and my daughter have had respitory problems face breakouts and I’m middle aged. My daughter sleeps all the time and if I’m not working find myself Sleeping until two. I never thought it was the pillow until recently when I did a timeline of what I did differently from last year that is causing this. That’s when I did the search and found this. I just hope that it has not caused long term health problems. I have now a full blown allergic reaction to foam products including memory foam. It started with supposed bamboo pillows (shredded memory foam) which I had for over a year and waking up with sinus problems, itchy hands, breathing issues and feeling like a bus had run over me. I went overseas for a month with no symptoms and first night home woke up with swollen mouth,face and hives on arms and legs. After a process of elimination and further exposure to memory foam mattress realised my problem was pillows and foam in general. Now have silk pillows and silk mattress cover and in process of getting 100% latex mattress. Also got rid of all carpet in house because of foam backing. It is 2 months since I have had reaction in bed but I can not sit on foam cushions or couch for longer than 2 hours unless I have towel or sheepskin between me and cushion without getting hives. I also now have reaction to plastic lids from take away coffee cups with lip swelling after 2 sips. Am now on special diet and supplements to help the liver detox toxins and am now suspicious that all this has caused damage to lining of stomach with endoscopy due next week. So Think twice before using any foam pillows as after a while toxins break down foam particles. We purchased The Big One gel topper on Black Friday. My husband, who was perfectly healthy, started going downhill during December and January. He now has balance issues and can’t walk or drive, and speech issues. Just had an MRI and are being referred to a neurologist because they don’t know what is causing these problems. He was bed ridden all of December with a broken knee, so was exposed to the mattress topper 24/7, while I only assign in bed less than eight hours. Could this be being caused by the gel topper? Going to pull it off today and give it a couple weeks to see if there is any change. I loved my pillow..the smell went away. I slept well. But I suddenly realized that my pillow could be the culprit for my hair getting Very thin on the sides where my head touches the pillow. And, what else is it doing to me while it kills my hair follicles?? Bye bye pillow! Smell of pillow has not disappeared after one month. I am not going to continue to use t as I gave deveoped a cough and it may be due to the pillow smell. 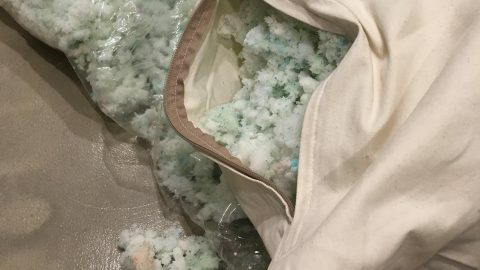 Is a Shredded Memory Foam Pillow Better?